Your personal Chord Trainer that Listens to You. Listening music teacher helps you to improve your listening skills: learn how to recognize triads and seventh chords. Chords build the basics of music composing. Triads are based on physical laws and consist of three notes. Note, the following order is from a physical view-point, not from looking at a triad on a sheet.The first note chosen for a triad is the root note (or fundamental). The second note in a triad - or highest note on a sheet - is a Fifth. And the last note taken into a triad is a Third. From a physical view-point the Fifth is the third harmonic in the harmonic series. The first harmonic in the harmonic series is equivalent to the fundamental. The second harmonic is the Octave. The octave sounds so similar to the fundamental, that it is often left out in music discussions. Meaning, that an octave and a fifth is treated as a fifth as the main characteristic. The third note in a triad - the middle note in the triad on a sheet - is a Third, which is the fifth harmonic in the harmonic series. Why is not the fourth harmonic in the harmonic series chosen? The fourth note of the harmonic series was not taken for the third note, because, the fourth harmonic generates a Fourth. However, the Fourth is the inverted interval of a Fifth (our second note chosen for the chord after the fundamental). Thus with the introduction of the Fifth, the Fourth was also introduced. Therefore, using the Fourth (or fourth harmonic) in the triad, would not bring a really new characteristic to the sound. Thus the notes used in a triad are distinct and still use the given physical relationship of the harmonic series. That is why triads sound good. Too complicated? Watch the video below. Listening-music-teacher will show you the relationship between our music system and nature. This relationship builds the foundation of the development of music: From stone age until today. "Just Intonation" and "Equal-Tempered Scale". After knowing the basic context of scales and intervals, the next video introduces you to tertian chords. Triads consist of three notes and have two intervals. Common chords use thirds as intervals. The quality (minor, Major, diminished or augmented) of the triad is determined by the stacking order of the thirds. All qualities come in three positions: Root position, first inversion or second inversion. Adding another third to a triad, leads to a seventh chord. Seventh chords consist of four notes and have three intervals. They allow for three inversion before they come back to the root position. A somehow special case is the harmonic seventh chord. The following video demonstrates the use of the chord explorer for single notes and intervals. For single notes the scale degree as a number and as a function is shown. Also the absolute and the relative solfege syllables are displayed. For intervals the quality and the number is explained. The diatonic interval names and the chromatic interval names are introduced. The chord explorer allows you to identify the name of single notes, intervals, triads and seventh chords by moving the notes around on the screen. 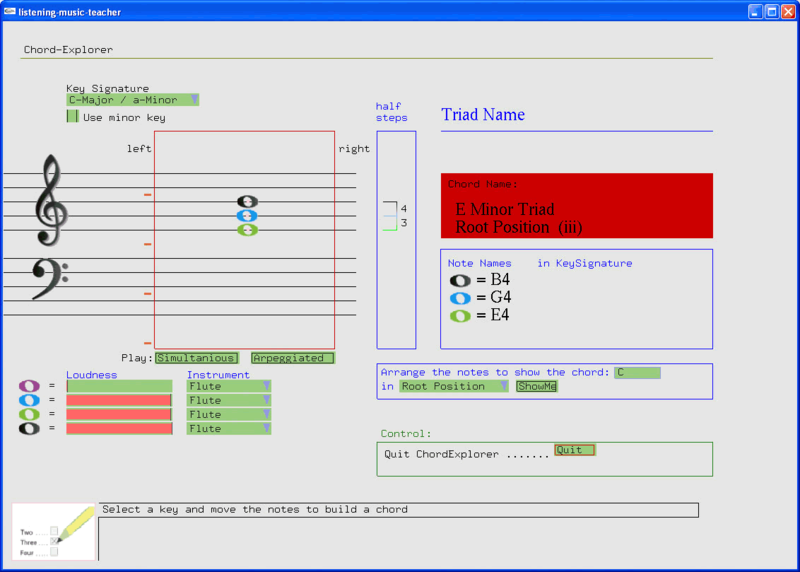 The chord explorer has four notes. By setting the loudness of a note to zero, the note disappears. From the key signature drop down menu you can choose a key signature. With separate box you can choose if you want to use the minor key instead of the Major key. You have a button to play the notes simultaneously, and another button to hear the notes one after the other. Furthermore you have the possibility to enter a triad or seventh chord name, the desired inversion, and let you display the chord on the staff. On the area to the right the distance in half-steps between the notes is shown (The Half-Step Brackets). To the left the name of the note, interval, triad or seventh chord is displayed. There are 26 exercises, which help to improve your listening skills and your recognition skills. 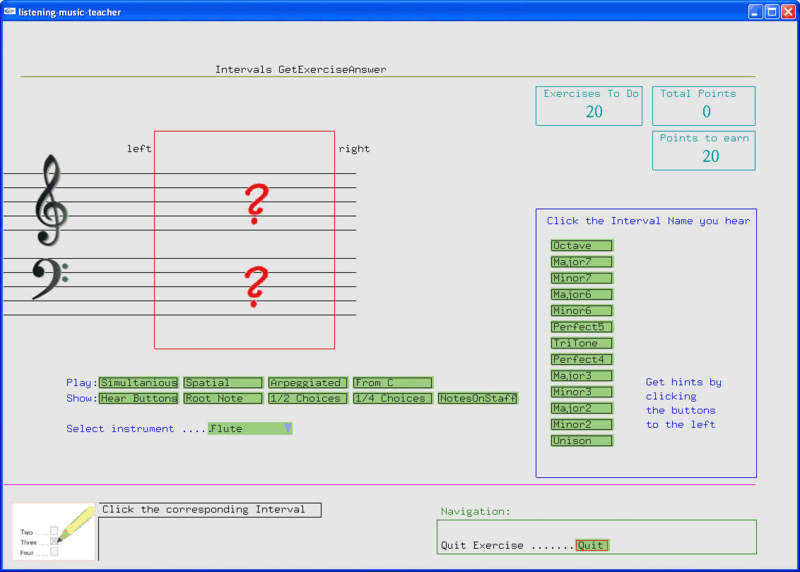 Usually the exercises just display question marks, as shown in the sample screen below. Your task is to listen and then give the correct answer. There are usually one or more help buttons, which ease this task. However, using these hints buttons lower the possible number of points you can earn for solving the question correctly. For illustration purposes the screens in the manual show the notes on the staff. After solving a question the answer is also displayed on the screen. There are a few exercises where you have to sing the answer. The purpose of these exercises is that you learn to hear a single note out of several notes played together. If you can hear the note you have to express that note through your vocal cords. That is like amplifying the sound of a particular note in your head. For example the first of these exercises is to sing the lowest note of a triad that you hear. In this lesson you have to identify the interval played. This is not an easy task for a beginner. Therefore skip this exercise for a later time. It is not necessary to have this skill to make the other exercises. In the other exercises you will be guided slowly to improve your listening skills. This exercise continues where the program Listening Singing Teacher left off. If you have finished the exercises in Listening Singing Teacher, this exercise should be easy. Normally only question marks are displayed on the staff. Here for illustrative purposes the option show “Notes on staff” was chosen. You can hear the interval as many times as you want: Just click play “Simultaneous”. If you click “Spatial” the lower note comes from the left speaker and the higher note comes from the right speaker. Of course using this hint will lower the points you can earn. Other hints are play “Arpeggiated”, which plays the notes one after the other. 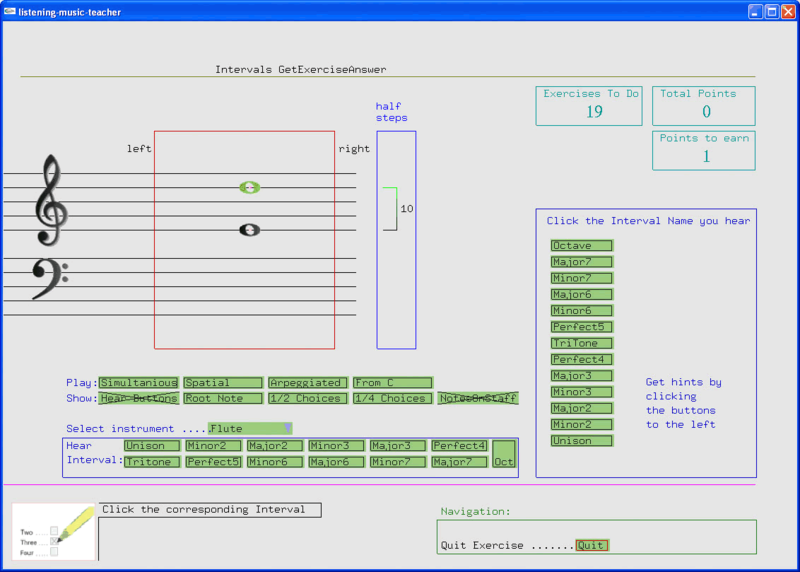 “From C” moves the lower note of the interval to C. If you click show “Hear Buttons”, a pane with the thirteen possible intervals opens. You can click any interval and you will hear that interval. Now just compare the interval with the interval in question. This is easy and makes the exercise solvable just by listening even for beginners (believe me it is easier than counting the half-steps). If you are still not sure you can remove wrong answers from the possible answer list (“1/2 or 1/4 Choices”). 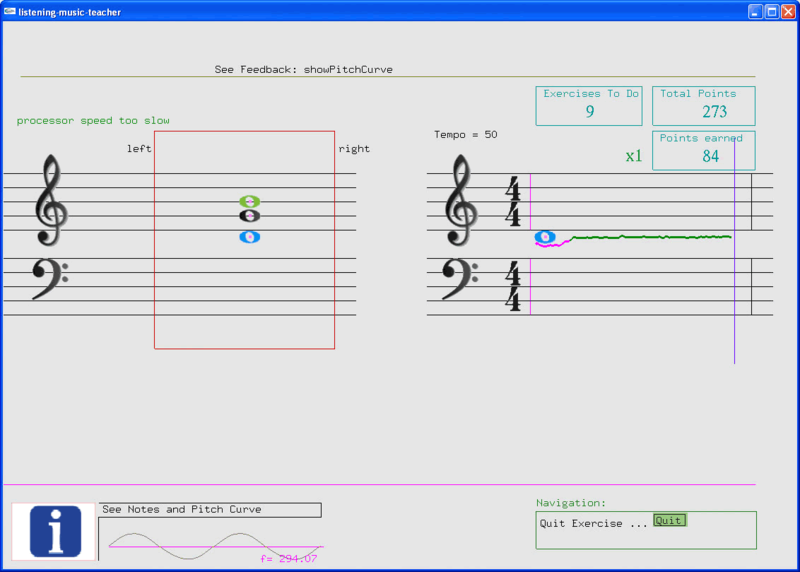 Finally you can display the notes on the staff and solve the question by counting the half-steps. Clicking the right answer button with the last option will still earn you one point. All exercises are made this way and encourage you to use as little hints as possible to earn as much points as possible. For this exercise you need the microphone. Since the evaluation of the singing is done in real time, you have to set the options before you start the real exercise. Note that in the upper right corner there is a multiplier displayed. By choosing options that make the task easier the factor will get smaller. The evaluation is done on how accurate you sing the note in question back. 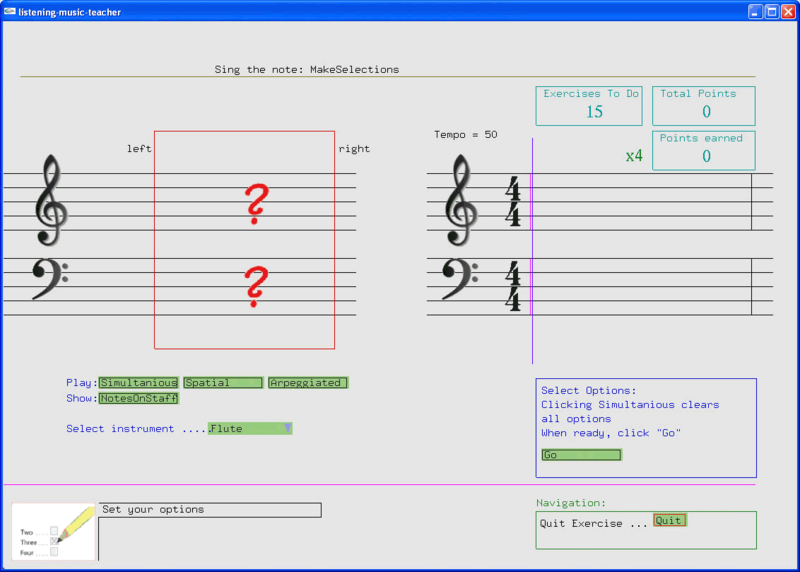 This exercise helps you to analyze chords..
On the next screen see the exercise in action, after you have pressed “Go”. For demonstration purposes the option show “Notes on staff” was selected. As with listening singing teacher you get real time feedback on your singing. In this way you can correct your singing during the evaluation. Since ear training is an important part of music understanding, we have introduced a new method: The Precision Listening Method. Our ear training method forces you to listen really carefully: after hearing two consecutive pitches, with a variable pause in between, you must indicate whether the second pitch was higher, lower or the same than the first pitch. Starting with the distance of a half step, in the first ear training exercise, the pitches to discern get closer with following ear training exercises. Until you have to discriminate pitches that are only 12 cents apart. The last ear training session lets you differentiate pitches up to 1 cent. In this last exercise the distances are randomly chosen, and are no more in relation to the equal tempered scale. That is the starting pitch does not necessarily coincide with a pitch assigned to a note in the equal tempered scale. In addition, you have to keep the first pitch very close in your mind, since by moving the slider to the matching position, the pitch of the slider position will be sounded. Thus this sound will distract you from the first sound that you have to keep in mind. The process is always the same: You listen to the first note (randomly chosen) and try to keep that note in your inner ear. After a certain time you hear a second sound. Your task is to tell if the second sound was lower, higher or the same. The program allows you to make the time shorter between the sounds, so it gets easier to remember the first sound. You can also hear both sounds simultaneously. If you then can hear a variation of the loudness, then the sounds are not the same. By adjusting the reference sound so, that it is near to the notes in question; you can easily determine which note is higher or lower. If you press the button play “With Reference”: You will hear that the change of the loudness of the overlapping frequencies gets lower as the frequency comes closer to the note played. That is if you change the reference frequency up, and the hauling gets faster, then your reference frequency must be higher than the frequency of the note played in parallel: Since, the nearer your frequencies are, the lower the hauling frequency will be (zero in case of a perfect match). If you hear a sound and then immediately a second sound then it is much easier to compare the two sounds. The longer the distance between the two notes is the more difficult it will get. The exercises start with 1.5 seconds between the notes. When you have to distinguish pitch differences of 12 cents you will recognize that it is difficult to remember the pitch of the sound that was 1.5 seconds before. Since a deviation of 12 cents is very little, you have to listen very carefully to the first note. It is not sufficient to just hear the note as you normally can do with a deviation of 50 cents. To remember a pitch precisely you are forced to listen with concentration. To get acquainted to this process, you have the possibility to decrease the time between the notes. In this way you can figure out how the sounds differentiate and what you have to remember exactly to solve the puzzle. With the delay time Factor you can increase the time between the notes. This is where relative and absolute pitch meet. The task to decide if the second note is higher, lower or the same is a relative task. However, if the time between the notes gets very long, - let's say a whole day -, then you need absolute pitch to remember the first note. Otherwise you can't say if the second note was higher, lower or the same. So, if you do the exercises with a longer delay, you will see the need to keep a sound with you for a longer time period. The only solution to improve this ability, - in our opinion -, is: to actively sing. 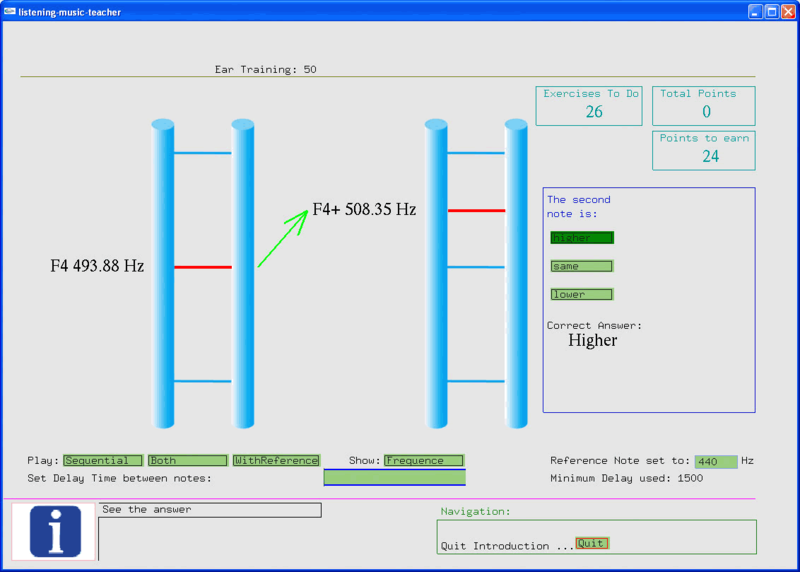 The Singing Funnel Method in our listening-ear-trainer program with its pitch feedback, is probably the best method to increase your singing precision.